A dear friend of mine put me onto the idea of using “cauliflower rice” as a substitute for regular wheat flour in certain recipes. The basic idea is you grab a cauliflower, remove leaves then use a food processor to blend it up to a consistency a bit smaller than rice grains. What you get is something that is healthy, freezes well and can be used to bulk up savoury dishes either in place of flour or (say) to replace rice/pasta when serving dishes up. 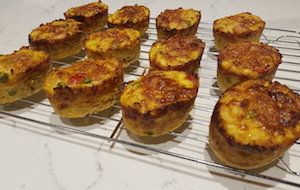 I did a bit of experimenting based off regular savoury muffin recipes and ended up with this – it’s pretty foolproof and flexible. End results are pretty healthy, freeze well and delicious – bag up in pairs in freezer bags and you’ve snacks for the week for hungry progeny. As written this will make about a dozen normal sized friands.